"We messed up and rolled out the Infinity Blade overpowered / without good counters, especially in the end game." Update: The Infinity Blade has been vaulted, and Epic released the following statement explaining why, and what to expect in its future approach to mythical items. 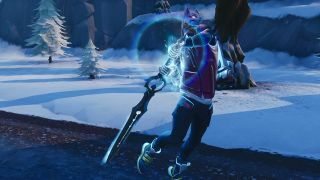 Fortnite’s Infinity Blade is a mythic weapon that was introduced this season, and it’s been causing chaos. It’s immensely imbalanced, blessing its wielder with regenerating health, the ability to leap great distances and the strength to destroy buildings in one hit. The response to the weapon’s introduction in the regular game mode and Winter Royale tournament has been largely negative, and Epic’s planning an update to address some of the issues, though likely not the ones players wanted. In the 7.10 update, you won’t be able to harvest resources with the Infinity Blade. I’m one of the few people who actually likes the Infinity Blade being in the regular game, but this definitely seems to miss the point. The replies on Reddit are pretty consistent: players want the Infinity Blade to have its own limited time event, allowing people to choose to play without it. It’s the same thing they’ve been asking for this entire time. I don’t think I’ve seen anyone mention harvesting and building, because that’s not what makes the weapon so incredibly powerful. Epic also clarified its philosophy on mythic weapons. It didn’t address their role in tournaments, like the Winter Royale, but more information on that will be coming early next week. Mythic weapons are obviously here to stay, however, and it looks like they’ll continue to feature in the regular mode, not just LTMs.